Welcome to Marvel Strike Force Minions page. 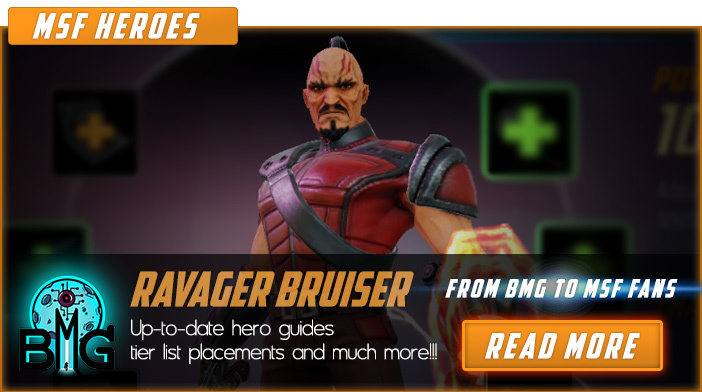 This is the full description of MSF Ravager Bruiser stats, skills, and abilities. In Marvel Strike Force, Ravager Bruiser is a Ravager minion who protects his allies. Ravagers are an interstellar crime organization made up of pirates, bounty hunters, mercenaries, smugglers, and thieves. There are more than a hundred Ravager Clans all across the Universe with a unique leader in each clan. They all operate under the Ravager code. Most notable are Yondu Ravager Clan, Stakar Ravager Clan, Aleta Ravager Clan, Charlie-27 Ravager Clan, and Krugarr Ravager Clan. Ravager Bruiser is pretty cheap for a protector. His price is 15 shards obtainable through premium orbs, violent vigilante orbs, and 4-6 Heroic Campaign mission. Ravager Bruiser doesn't have a clean taunt ability, instead, he has a chance to taunt a target he attacks. He can cast Defense Up which can heal him and last 3 turns if enhanced. He also has a decent block chance. Ravager Bruiser cannot be summoned by Yondu. Ravager Bruiser is a boarding expert who uses an energy shield to deflect attacks. Attack primary target for 80% damage. 30% chance to Taunt for 1 turn. We hope that you enjoyed the description of MSF Minion Ravager Bruiser. For detailed information about other MSF Characters check our MSF Minions page.